As a child of immigrants and tradition – I sometimes hate to deviate from age-old recipes but, as always, lack necessitates innovation. I’m sure, to those familiar with Falafel and have grown up eating it, the idea of baking it is near abhorrent. For this, I truly and deeply apologize. I’ll be honest – I would have fried the Falafel as tradition dictates but I didn’t have enough oil to fry with! Furthermore, the holiday season is ripe with overeating and I can feel my thighs expanding. I figured, just for once, that I could shun my Paula-Deen-excess-loving-butter-glorifying ways and do without the extra fat. 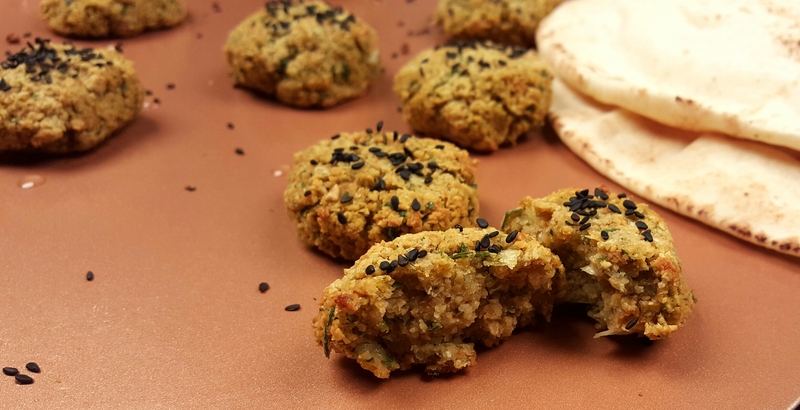 Have you had Falafel before? Does hearing the word ‘Falafel’ make you want to rhyme it with words like waffle or awful? Your answer should be yes. Don’t judge me. Like hummus, Falafel’s origin is claimed by at least half-a-dozen countries in the Middle Eastern region of our world. Regardless of where it came from, it’s utterly delicious. It is basically a ball of ground chickpeas with spices and herbs that is usually deep fried. Please excuse my weird scratch marks near my wrist. My cat is insane. After you have soaked the chickpeas, drain them well. 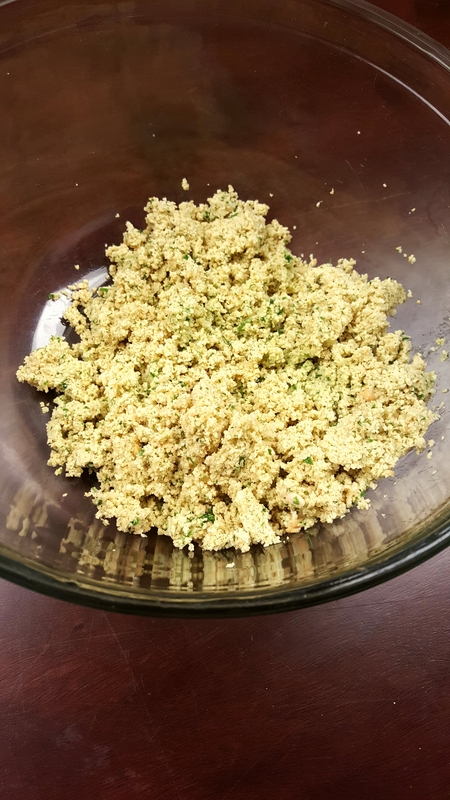 In a food processor, grind together your chickpeas, onion, garlic and parsley. Don’t crowd the food processor otherwise you won’t get the right consistency. Grind the chickpea mixture in batches if you must. You’ll want to reach a texture a little coarser than sand. I found myself adding about 2-3 tablespoons of water as I ground the chickpeas just so it could reach the desired texture. Once you have finished grinding the chickpea mixture, pour the mixture into a bowl. Add all of your spices, flour, baking powder, salt and 3 tablespoons of water. Mix until just combined and don’t over-mix. 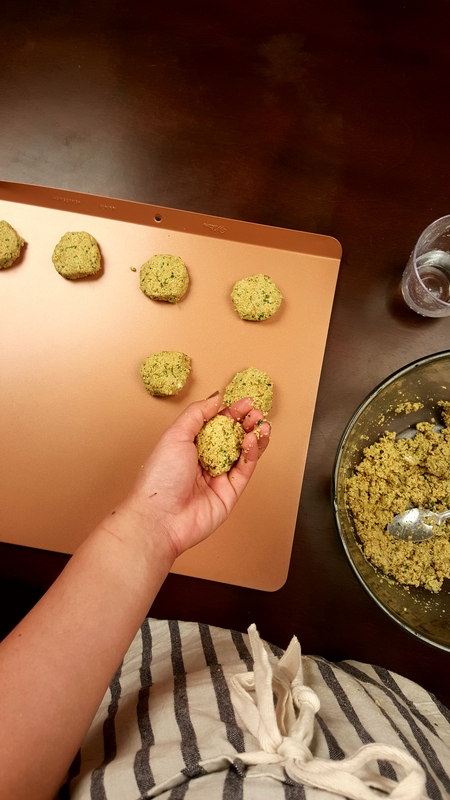 With wet hands, form the chickpea mixture into about 2 inches wide patties and place them on their baking sheet. Once you have formed all of your patties, drizzle a bit of olive oil on the top of each patty and sprinkle sesame seeds on top. (I ended up using black sesame seeds because it’s what I had but normal sesame seeds are more traditional. Either way – I absolutely love sesame seeds and will take them in any color. 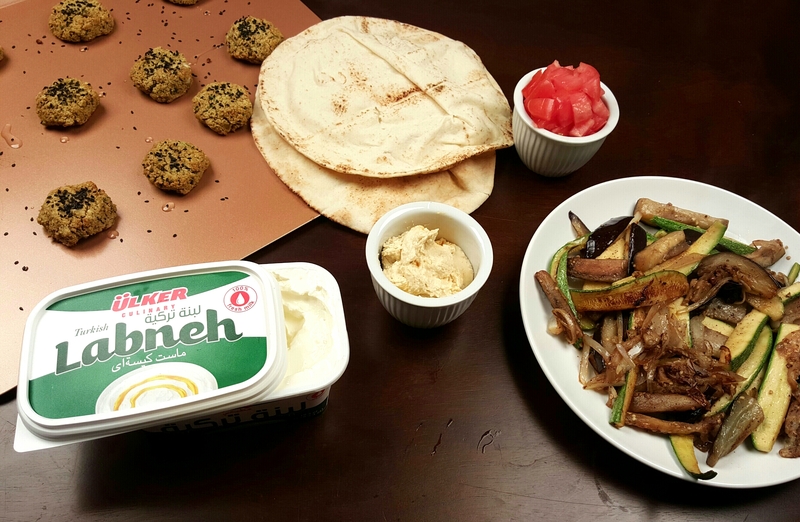 Make yourself a giant spread of pita, olives, tomatoes and cucumbers, sauteed veggies and hummus and labneh. 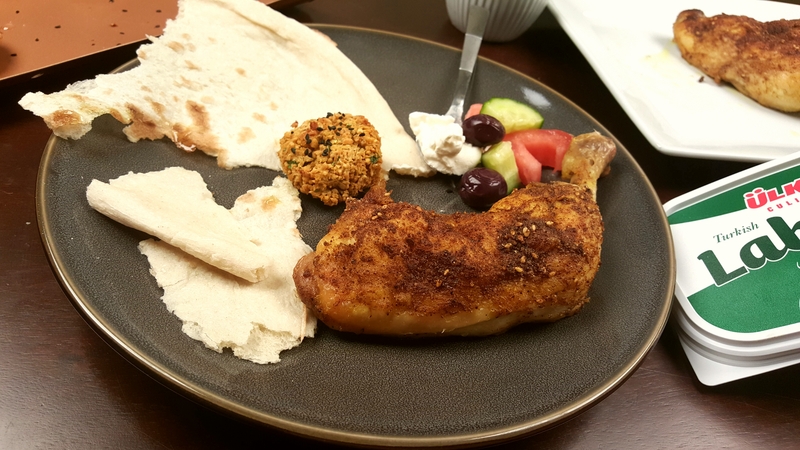 And if you’re like me – you’ll roast some spiced chicken thighs just to cram into your already-overflowing pita sandwich.